NIST Has A New Clock! Home » Science Notes Posts » Measurement » NIST Has A New Clock! NIST (National Institute of Science and Technology) is the part of the US Government responsible for providing the measurement standards we use in science and industry. Your computer and phone most likely checks the time periodically by contacting a NIST computer. “What time is it?” just got a whole lot more accurate. 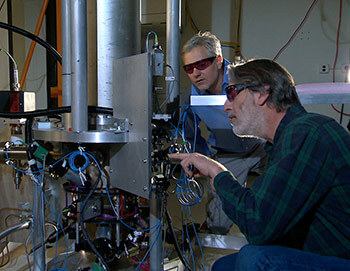 NIST announced the launch of the NIST-F2 atomic clock to replace the old NIST-F1. The new clock is nearly three times more accurate, with NIST-F1 only missing a second once every 300 million years. This means the NIST-F2 is now the World’s most accurate time keeper. Who needs a clock that accurate? Probably no one right now. Although, each time a measurement standard is more precisely defined, new discoveries in science and technologies using that measurement tend to follow. Measurement is the tool of science and engineering. Who knows what will come from this new, better tool? Only time will tell. I had a Mickey Mouse watch in college. It was surprisingly accurate. It held within a few seconds per year compared to the atomic clock at the U.S. naval observatory.. However, even with this extreme accuracy it was impossible to use this device to measure events lasting less than say 5 seconds. For anything faster it was rendered inaccurate by the centuries old ocular compatibility interface and the visual acuity of the operator. So in the end it was just a watch.